The city of Laguna Beach announced Monday that it’s launching a “Keepin’ It Clean Laguna, Leave No Trash Behind” anti-litter campaign that it hopes will encourage visitors to use the 600 trashcans and recycling containers available throughout the city. 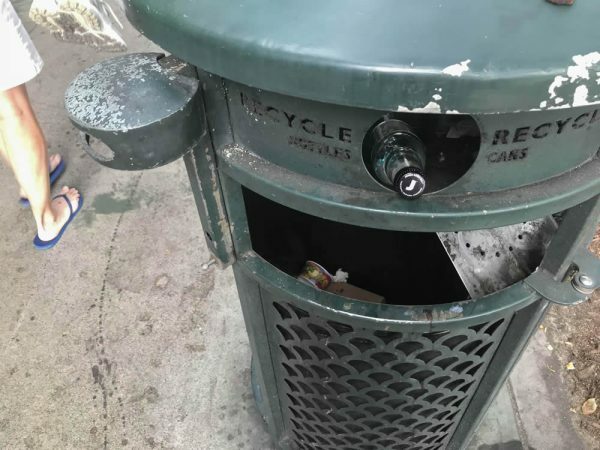 City officials said the campaign aims to teach visitors how to dispose of their waste and recyclables responsibly, especially at the receptacles located at the top of the city’s beach access stairways and along Coast Highway. The city’s efforts will include placing signs near trash receptacles and a social media campaign encouraging visitors to dispose of their trash in receptacles located on beach accesses and public places. Effective July 1, 2018 through June 30, 2019, Laguna Beach Unified School District students are eligible for free or reduced-price meals if their household income is less than or equal to federal guidelines. Families do not need to turn in an application when the household receives a notification letter saying that all children automatically qualify for free meals when any household member receives benefits from CalFresh, CalWORKs, or FDPIR. Children who meet the definition of foster, homeless, migrant, or runaway, and children enrolled in their school’s Head Start program, are eligible for free meals. Contact school officials if any child in the household is not on a notification letter. The household must let school officials know if they do not want to receive free or reduced-price meals. Applications will be sent with a letter about the free and reduced-price meal program. Families who want to apply for meal benefits must fill out one application for all children in the household and give it to the nutrition office at 550 Blumont Street, Laguna Beach. To apply online, visit www.LunchApplication.com, or call Debra Appel at 949-497-7700 ext. 5216 for help filling out the application. The school will let families know if their application is approved or denied. Families may turn in an application at any time during the school year. Every 40 seconds, someone takes their own life and forever changes the lives of those who know them. “Suicide: The Ripple Effect” will have a showing on Monday, Aug. 13 at 7:30 p.m. at Metro Pointe Stadium 12 in Costa Mesa. The film showcases the devastating effects of suicide and the tremendous positive ripple effects of advocacy, inspiration and hope that are helping millions heal and stay alive. Tickets are $13.25 and advance purchase is required at https://gathr.us/screening/23848. The film is appropriate for teens as young as 12 with parental supervision. The film chronicles the story of Kevin Hines, who at age 19 attempted to take his life by jumping from the Golden Gate Bridge. He was in the 1 percent of 2,000 jumpers who survived. Since then, Hines has been on a mission to use his story to help others find recovery and stay alive and has become one of the world’s most prominent suicide prevention speakers and advocates. Following the screening there will be a Q&A session. Panel attendees to be confirmed. For more information, visit suicidetherippleeffect.com. Fifteen Boys & Girls Clubs in Orange County—including the Boys & Girls Club of Laguna Beach—are collaborating on Aug. 15 to raise a total of $150,000 for the kids in their programs. The 15 clubs combined have a total of 110 sites and serve over 95,922 youth annually. According to the Institute for Social Research and School of Public Health at the University of Michigan, for every $1 invested in a Boys & Girls Club, the community receives $10 in return. The city of Laguna Beach recently received the California Emergency Services Association Gold Award for outstanding service in emergency management. City officials said Thursday that it was Emergency Operations Coordinator Jordan Villwock’s work creating both shelter and evaluation plans that prompted the city of Aliso Viejo to nominate Laguna Beach for the award. Villwock will receive the award at the CESA Annual Emergency Management Training and Conference in September. The city of Laguna Beach has partnered with national nonprofit organization Artspace to research and develop policies and programs to offer affordable creative space. Artists and other creatively-inclined residents are asked to take a 10-minute survey at www.artspace.org/CreativeSpaceLaguna.